Description: This item is a shot glass with an engraving of the Japanese Garbage Pail Kids version of the United States Garbage Pail Kids 1st Series character 1a Nasty Nick / 1b Evil Eddie. The Japanese Garbage Pail Kids were called Bukimi Kun. The shot glass is approximately 2-1/2" high. The text on the back of the shot glass is from the back of the Japanese Garbage Pail Kids sticker, and it translates to "Please stick at the same number". The text was appropriate for the back of the sticker but not for the shot glass. Description: This item is a skateboard with a couple of Garbage Pail Kids characters drawn on it. 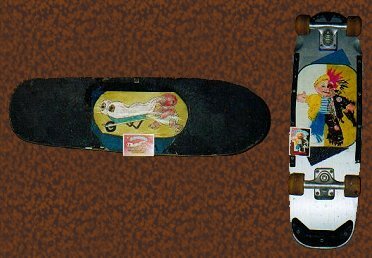 On the top of the skateboard is the United States Garbage Pail Kids 2nd Series character 81a Split Kit / 81b Mixed-up Mitch. On the bottom of the skateboard is the United States Garbage Pail Kids 6th Series character 229a Claire Stare / 229b Bloodshot Scott. 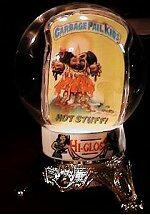 Description: This item is an ordinary snow globe with a Garbage Pail Kids "Hot Stuff" button placed inside. The Garbage Pail Kids button was an officially licensed item from Topps. Description: This item is a toy spider that was claimed to be of the United States Garbage Pail Kids 3rd Series character 98a Charlotte Web / 98b Didi T. This toy was made by Dakin Inc. in 1987. However, it is clearly not a Garbage Pail Kids item. Description: This item is a Garbage Pail Kids card that had the sticker front switched with a sticker front from another Garbage Pail Kids card. Cards with switched sticker fronts are not difficult to identify because there are several things you can look for: there are bends or lumps in the sticker, the die-cut impressions on the sticker front do not match the impressions for the card back, the card has soft edges, the inner sticker does not match up with the outer border, the sticker front and card back do not go together (i.e., there is no such variation), and the outer border is not perfectly centered on the card. Description: These items are ordinary switch plates that had homemade Garbage Pail Kids stickers stuck to them. The stickers may have been attached to the switch plate and then covered with polyurethane. Description: These items are ordinary ceramic tiles that had homemade Garbage Pail Kids stickers stuck to them. The tiles measure 4-1/4" x 4-1/4" and have cork attached to the bottom, so they do not slide around. The artwork used for the coaster was squashed to fit into a square. The stickers may have been attached to the tiles and then covered with polyurethane. The coasters are waterproof. 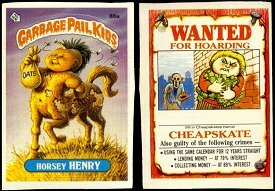 There have been many Garbage Pail Kids uncut card sheets offered for sale on the Internet. Unfortunately, there are many uncut sheets from the United States Garbage Pail Kids 2nd Series and United States Garbage Pail Kids 3rd Series that are bootlegs. 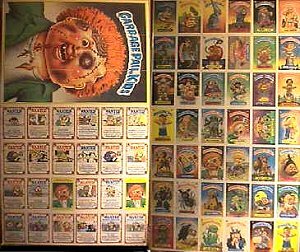 Most uncut Garbage Pail Kids card sheets started out as double-sheets with 264 cards on them. The uncut sheets were cut down to 132 cards, which is how most of the uncut sheets are found. The original United States Garbage Pail Kids 16th Series separation sheet (as described in the United States Garbage Pail Kids All-New Series 1 section on page 4) only had 44 cards on it because the series was in the test phase of being printed. Uncut sheets with anything less than 132 cards on them are usually fakes or bootlegs. Uncut sheets from the original Garbage Pail Kids series were not usually sold to the public, so many of the uncut sheets from the original Garbage Pail Kids series currently offered for sale were smuggled out of the factory or were taken from the dumpsters at Topps. Topps had auctioned a small amount of the uncut sheets on eBay. Uncut sheets have distinctive markings printed on them. The section of the United States Garbage Pail Kids 5th Series uncut sheet shown above has "Board 1 - © 1986 Topps Chewing Gum, Inc. 4-490-05-03-6 - Slit A" printed on the border. Any uncut sheets without similar information are either bootlegs, fakes, or trimmed. 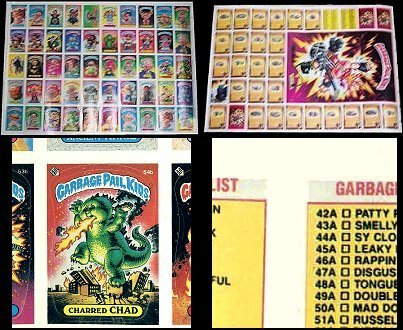 The thumbnail image on the right is of an article discussing the seizure of a large quantity of bootleg United States Garbage Pail Kids 2nd Series uncut sheets in New York. You can click on the thumbnail image to view the entire article. A few types of bootleg and fake uncut sheets are discussed below. Description: This item is a bootleg, uncut sheet from the United States Garbage Pail Kids 2nd Series, and these uncut sheets were most likely the ones described in the article above on uncut sheet seizures. There are 50 cards on the uncut sheet. The die-cuts are printed onto the uncut sheet and also punched out. The problems with the die-cuts can be seen in the picture above. The borders of the cards are different colors than the rest of the uncut sheet because the color differences were printed onto the uncut sheet. The borders on an authentic uncut sheet are the same color as the rest of the uncut sheet. The uncut sheet does not have any of the markings that an authentic Garbage Pail Kids uncut sheet would have. Description: This item is a bootleg, uncut sheet from the United States Garbage Pail Kids 3rd Series. There are 42 cards on the uncut sheet. Some of the cards from the bootleg uncut sheet do not have the correct card backs when compared with the authentic United States Garbage Pail Kids 3rd Series cards. The picture on the right is of a card that was cut from the bootleg, uncut sheet. The edges on the card were not cut straight. The card shown is 86a Horsey Henry. The authentic version of this card has a checklist on the back, but the bootleg version has "Wanted For Hoarding" on the back. The print quality of the uncut sheet is very poor. The colors are slightly faded, the card images are slightly blurred, and the colors look dithered. The uncut sheet does not have any of the markings that an authentic Garbage Pail Kids uncut sheet would have. The die-cuts are printed onto the uncut sheet and also punched out. The puzzle on the back of the uncut sheet has lines printed on it, but an authentic uncut sheet does not have any lines printed on it for dividing up the cards. Description: These items are bootleg, uncut sheets from the United States Garbage Pail Kids 2nd Series and the United States Garbage Pail Kids 3rd Series. There are 50 stickers on the United States Garbage Pail Kids 2nd Series uncut sheet, and there are 44 stickers on the United States Garbage Pail Kids 3rd Series uncut sheet. The United States Garbage Pail Kids 2nd Series uncut sheet measures approximately 18-1/4" x 25-3/8". The person that designed the bootleg United States Garbage Pail Kids 2nd Series uncut sheet stuck sticker fronts from the United States Garbage Pail Kids 2nd Series cards onto a large piece of paper. The large piece of paper was then copied to make the bootleg, uncut sheets. The bootleg, uncut sheet from the United States Garbage Pail Kids 3rd Series was probably designed in a similar way as the United States Garbage Pail Kids 2nd Series bootleg, uncut sheet. 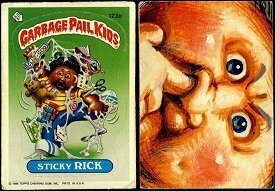 Many of the stickers on the United States Garbage Pail Kids 2nd Series uncut sheet were torn, separated, or damaged when they were transferred onto the large piece of paper, and these flaws can be seen on the sample image on the left. 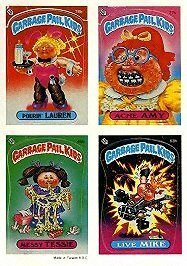 The center portions of the United States Garbage Pail Kids 2nd Series stickers for 76b Pourin' Lauren and 77b Acne Amy were pulled and slightly torn when being transferred over. The final product does not have any separations or tears on it, but the tears were printed onto it. The uncut sheets are thin, yellow-backed, sticker paper. The die-cuts are printed onto the uncut sheets and also punched out. The color quality of the uncut sheets is very poor. The uncut sheets have "Made in Taiwan R.O.C." printed at the bottom, and there are 5 evenly spaced unpunched punch holes at the top of the uncut sheets. The image on the right is of the bootleg, uncut sheet from the United States Garbage Pail Kids 3rd Series. Description: This item is of a United States Garbage Pail Kids 2nd Series uncut sheet that was trimmed down to 44 cards. This section was cut off of an authentic, uncut sheet from the Untied States Garbage Pail Kids 2nd Series. By cutting up a sheet of 132 cards, a seller can sell three sheets of 44 and could potentially make three times the profit. The border on the uncut sheet is very thin and has no markings because it was trimmed down. It is possible that the sheet was cut like this at the factory, but a full uncut sheet from the original United States Garbage Pail Kids series should have at least 132 cards. The item was listed as a fake because it is not a full, uncut sheet of at least 132 cards. However, it was cut from an authentic, full sheet of 132. Description: This item is a homemade United States Garbage Pail Kids 16th Series card. The card was created by Brian Albery. Brian had inserted the card number, character name, die-cuts, and "Peel Here" arrow onto a scanned-in copy of his drawing using a graphics editing program. Card number 623a was used for the United States Garbage Pail Kids 16th Series. Brian's card was 623a Tim Bur, but the original United States Garbage Pail Kids 16th Series card was 623a Tattoo Drew, which was used for the United States Garbage Pail Kids All-New Series 1 card 25a Drew Tattoo. Brian had printed up his homemade Garbage Pail Kids card and autographed it on the back. Brian's created his card years before the United States Garbage Pail Kids All-New Series 1 was released.